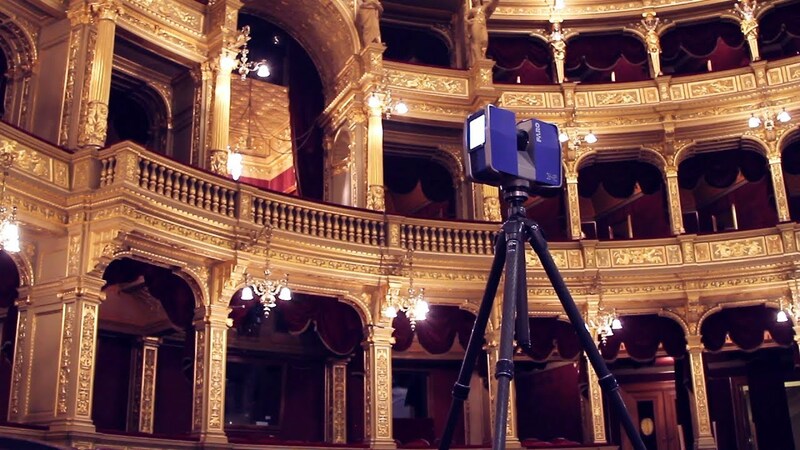 CÉH Inc. of Budapest, Hungary was tasked with the enormous job of measuring and modeling the Hungarian State Opera House. The combination of building surveying with geodetic methods and architectural 3D modeling, with the help of point cloud technology, made it possible to develop a detailed 3D model of this elaborate building while it remained in use. The final model is being used for the ongoing renovation process and will be used later for the management of the historic building as well. The decision to build the Hungarian Opera House was made in 1873. Following a public tender, the jury selected the design submitted by famed Hungarian architect, Miklós Ybl (1814-1891). Construction of the neo-classical building began in 1875 and, despite minor delays, was completed nine years later. The opening night – to which Emperor and King Franz Joseph was also invited – was held on September 27, 1884. Miklós Ybl’s neo-renaissance palace has remained virtually unchanged in the 130+ years since, and continues to attract admirers of opera and ballet alike with its repertoire and world-class acoustics. Each year, thousands of tourists visit the building to take in one of Budapest’s most impressive 19th century national monuments. CÉH’s assignment was to complete a survey of the Hungarian State Opera House and its other buildings (shop, sales center, offsite storage, rehearsal hall, warehouses, offices and workshops) and, based on the point cloud data, to develop an architectural model of the current state of the buildings. The collected data was processed using Trimble RealWorks 10.0 and Faro Scene 5.5. It is important to note, that obtaining the data took considerably less time than to process it. Even though data processing took place essentially in tandem with the survey, the building’s complicated structure and spaces, as well as the complexity of the project made processing a lengthy task. The tandem surveying and processing workflow caused additional difficulties. Every newly-received point cloud detail had to be perfectly fit into the developing model based on the previous point cloud material. There was no time to update the already submitted materials. Given the fact that the survey was done while the Opera House was in use, it was impossible to survey whole building blocks in their entirety. There were inaccessible rooms and the warehouses had to be vacated. This meant many rounds of surveying until a certain building block could be finished. The result was a slower survey and registration process that also required significant administrative work. Although there were many spheres and checkerboards on hand, the Opera’s workers would accidentally move these tools, which prevented the surveyors from later aligning the point clouds. As time passed, however, the two crews got used to each other, and everyone’s work proceeded more smoothly. Certain spaces in the building (like the props warehouse) were always changing, or else the surfaces of these spaces were too complex for the measuring instruments (e.g. the rigging system covered by a steel mesh, black surfaces backstage), which hampered the process of obtaining exact measurements. The most difficult and time-consuming part of the job was surveying the vaulted, sometimes zig-zag spaces, which constitute the auxiliary and mechanical areas of the building on the lower levels. The elevations, too, presented the surveyors with similar vaulted structures – the legacy of the original 19th century architect, Miklós Ybl. The props and other equipment often obscured key surfaces, such as walls and floors. In these cases, survey results can be the base of only a very rough 3D model. Photos and videos would prove very useful in documenting the details of the spaces not accessible by the scanner. The raw measurement data was imported to Faro Scene 5.5 for pre-processing and Trimble RealWorks 10.0 for finalizing the measurements, which took considerable time; the exported point cloud files were also very large. Both types of data are very hardware-intensive. File size is a significant factor in terms of data management. Since an enormous amount of point clouds was produced and the point-count was as high as 40 million points per room, it was impossible to connect them as they were. First, the point-count had to be reduced using Trimble RealWorks. After this process, a digit could be cut off; the team ended up connecting smaller point clouds of 3-4 million points. Blocks of 20-30 million points were then assembled and saved from these reduced point clouds with the maximum density of 1 point per sq cm. This size is still dense enough and contains enough detail for the modeling work done in ARCHICAD. After the registered and reassembled point cloud file was exported in E57 format, readable by the design software, the team of architects could begin their work. ARCHICAD 19 was a significant asset in the modeling process. Managing the files was greatly helped by using GRAPHISOFT BIMcloud, which provided access to the file from practically anywhere, at acceptable speeds. This was no small achievement, since the full project file exceeded 50 Gb. Analysis of the building’s 3D mass began with the help of an old 2D survey plan. This 2D material was refined and augmented by the point cloud. The main deviations from the available 2D plans were obvious from the beginning. The building’s stories, with their many and varied levels, presented the most challenges. A renovation in 1984 introduced new, more modern structures (such as steel supports for the rigging system). The availability of these renovation plans helped in understanding the complex steel structures, since the surveying equipment was not capable of detecting certain narrow elements clearly and understandably. The same was true for the constantly moving parts of the building – such as the steel stage structure - which remained in use during the survey. Almost every geometry could be modeled with ARCHICAD. Very complex elements, like the statues, were created in other software and then imported into ARCHICAD as triangulated 3D surfaces (Meshes). The polygon-count of these elements is very high, so they were added to the model in the final stage. The architects’ biggest constraint in this case was hardware capacity. Both the point cloud and the model file tended to be very large, which made file management more difficult. With smart tricks, library and layer management, a smaller file size could be achieved that made it possible to deal with the model more easily. An important issue was to purge embedded library elements, since they increase the file size, which may not be a problem with a smaller model, but in this case the original geometry was already a high-polygon one. Another important issue was to save redundant elements as Objects in order to reduce file size and to make the 2D navigation smoother. This way, one Object could be placed as many times as needed, instead of multiple Morphs or other elements. Of course, this didn’t reduce polygon-count so 3D performance wasn’t affected fundamentally, but it did affect file size and the 2D-handling of the file. This could be refined even more with simple 2D symbols defined for the Objects. With smart layer combinations – for example, by making it possible to switch off the polygon-heavy decorative elements – 3D-navigation and additional 3D modeling became more manageable. Finally, the many hours of work and effort paid off with the result: a building model that anyone can explore on their own device. This success required the surveying process to be planned and scheduled in detail, since the surveyors could not always access all parts of the building. Continuous and effective work on the surveying and modeling tasks required the dedicated, consistent cooperation between the staff of the Hungarian State Opera House and the CÉH team of engineers who are proud that their achievement serves to support the preservation and renovation of the building and of Hungarian culture. Although the ARCHICAD model was smartly optimized to be easily manageable for all possible uses, the full final model still contains close to 27,5 million polygons and approximately 29,000 BIM elements. This BIM model size was hardly manageable with GRAPHISOFT’s mobile product, BIMx. The recently published BIMx Lab, a technology preview version of BIMx, was optimized so that it can handle huge and detailed models with polygon-counts previously unimagineable. According to the BIMx development team, when using the new BIMx engine, the size limitation moves back to ARCHICAD; every model ARCHICAD can handle is easily navigable in BIMx Lab! Download the BIMx Lab app from the Apple App Store (technology preview). 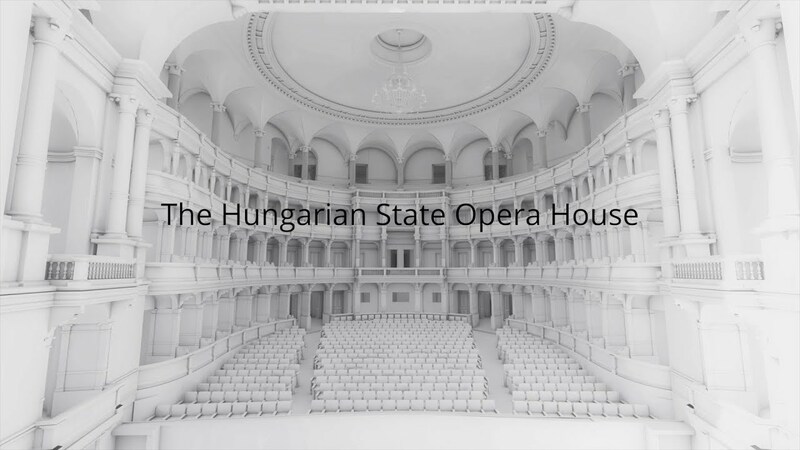 To experience its capabilities, the BIMx Lab model of the Hungarian State Opera House has been made available as well. CÉH Planning, Developing and Consulting Inc. – as the leading engineering business of the CÉH Group – is a key player in the Hungarian planning and development market. During over 25 years of operation, CÉH has amassed significant experience in the preparation, planning and construction of buildings and the project management services associated with implementation. CÉH employ a team of professionals covering all engineering activities associated with all development and design disciplines. CÉH has some 80 full-time employees as well as over 10 affiliates and 150-200 contracted partners to provide comprehensive services for its clients. They have carried out projects involving multiple engineering tasks in a large number of complex development projects at a national scale where they single-handedly delivered the full range of engineering services to their clients. Due to CÉH’s personnel having several years of domestic as well as international experience, they are able to manage the entire BIM process. Their efforts are confirmed by the success of a portfolio consisting of more than 150.000 m2 in implemented BIM projects. CÉH Inc.’s architects have been using ARCHICAD for more than 10 years. They currently have 26 seats and use BIMcloud as well. Three- seven architects worked on the case study project using ARCHICAD 19.